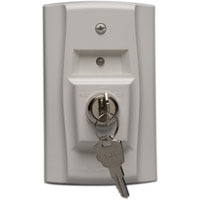 The RTS151 and RTS151KEY remote test stations are automatic fire detector accessories designed to test duct smoke detectors from a convenient location. For 4-wire detectors, the RTS151KEY test station features a multi-colored LED that alternates between steady green and red. For 2-wire detectors, the LED illuminates red for alarm.